With fall wildlife migrations under way, the Blaine County Sheriff’s Office is investigating an increased number of vehicle-and-wildlife collisions. There were three reported last week. Although no motorists were injured, all three accidents were fatal to the animals. Two of the accidents occurred along the newly opened state Highway 75 stretch near St. Luke’s Wood River hospital. The first accident occurred at about 8:15 p.m. on Tuesday, Sept. 30, near milepost 123.5 just south of the hospital. According to the Sheriff’s Office report, an elk died after being struck by a northbound Ford 210 Flex Wagon driven by Monique Tatsuno, 70, of Ketchum. “The elk was injured, but had unsurvivable injuries so we dispatched it,” Sheriff Gene Ramsey said Monday. The third collision also occurred on Saturday, this time at around 11 p.m. at the intersection of Hospital Drive and Highway 75. Ramsey said a deer was killed when it collided with a northbound 2002 Volkswagen Jetta driven by Brittany Campbell, 24, of Darby, Mont. The sheriff said drivers need to be constantly aware of the possibility of an animal running across a road in front of them. 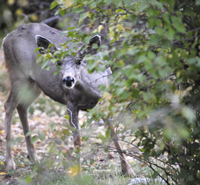 “This is the time of year when they’re on the move, deer and elk, and they’re very active, especially at night, throughout the county,” Ramsey said.